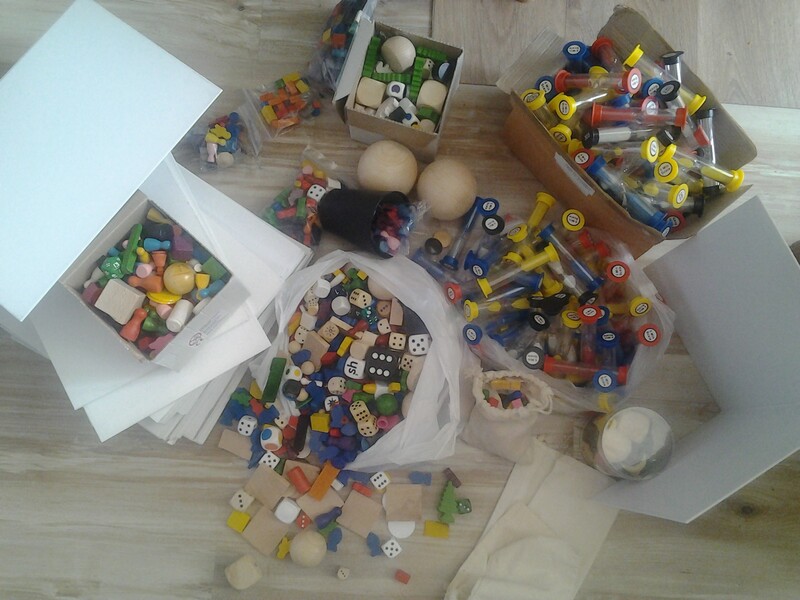 Creating board games only requires some time, maybe some basic theories of board game design and a little material. Most of this material can be made out scrap : take an old piece of cardboard and you have a board, draw some rectangles on a sheet of paper then cut it : you have cards… Most of the time, prototyping doesn’t require good-looking or fancy material, as you may throw away half of your creation to improve it anyway. – Seeing some material can improve creativity by “triggering” something in one’s mind (ohh, I could use THAT !). * In exchange, I allow people to discover their actually awesome selection of various pawns, dices, bags, hourglasses etc… via their official website or flyers I’ll give during my journey.